Very few schools were constructed during World War II, as few school districts had the ability to permanently improve their school plant. In addition to the lack of construction, the return of American soldiers from World War II resulted in an increase in the United States’ birth rate. 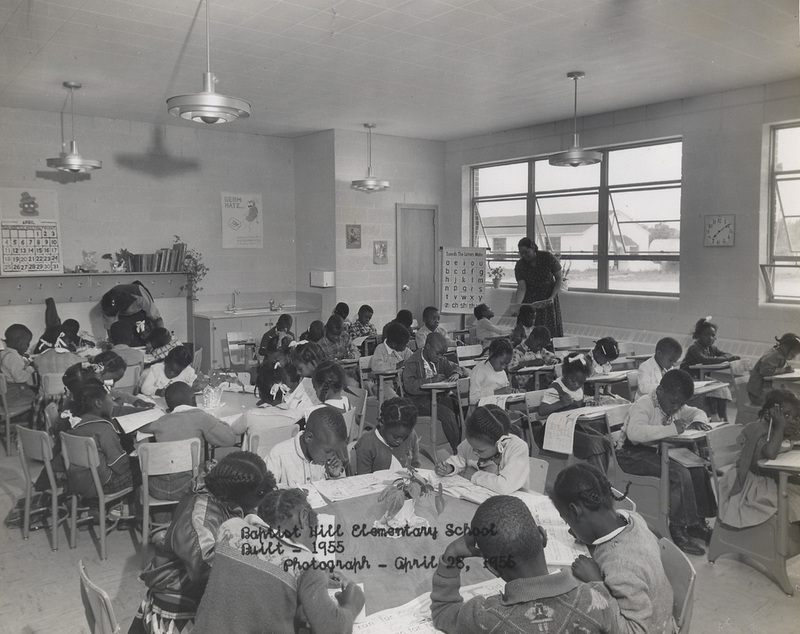 Because these children would first enter elementary school, school administrators, architects, and educational consultants focused their ideas and efforts on the design and construction of elementary schools at the beginning of the 1950s. “We want buildings which are friendly to children. We believe that the low-lying, sprawled-out type of building, close to the ground, one story high, straight in its lines, honestly functional, is less awe-inspiring and more friendly in the eyes of the child, though it may not look as grand to adults as some of our multi-storied Roman efforts.” Schools constructed in the past were not suitable for educational needs after WWII. In schools designed in the first half of the twentieth century, equipment such as desks and chairs were nailed to the floor limiting the mobility of children and teachers in the classroom. Lighting and ventilation in older schools were not conducive to education, as some areas of the classroom received more light than others and the overall air flow was poor. High school curriculum became more specialized after WWII as school districts began offering agricultural classes, vocational training, and home economics in addition to maintaining traditional classes in language, science, and mathematics. These courses required specialized classrooms with particular equipment, and the “campus plan” emerged to accommodate the new curriculum. Schools built on the campus plan consisted of several different buildings dedicated to different courses and specializations. Equalization schools, while constructed to meet a specific need of the state to prove "equal" school facilities among the races, did incorporate modern educational thought and modern architectural construction techniques and materials in the schools.